Sling/Polespear: The spear must be charged by muscle power, the charge held in place by hand and released by hand release only, no mechanical trigger release or holding mechanism is allowed to be used or to be on the polespear or sling. Includes gear commonly known as sling, Hawaiian sling, polespear, three prong, etc. That is correct, I have several IUSA records for pole spear and speargun and checked with them about this in the past. The fish don't seem to care what they are shot with and as I leave the pursuit of records to others the weapons used are unlimited (no gas or explosives as the energy supply is finite, whereas I can be recharged with burgers and drink). However some rollerspears have hooks, so the question would be are they engaged or not, plus who is doing the checking? Cool pic of my resting hook. Thanks for posting. 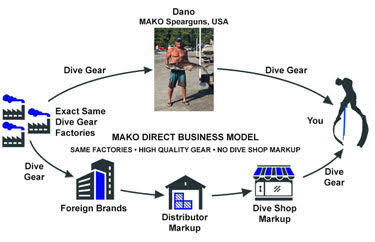 I designed my MAKO Pole Spear resting hook so that it can be rapidly installed and removed with no tools required. In the pic above that Marco posted, you might not be able to see just how easy it is to install and remove. So, I will put a video below showing just how fast and easy it is to install and remove. can I simply unload the power band, remove the resting hook, tuck it in my sleeve, then reload and shoot the fish? side note - your customer service guys are great. good stuff!